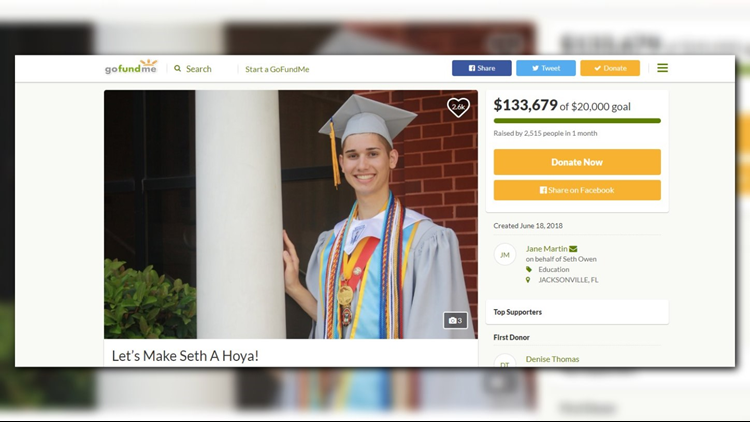 Florida teen Seth Owen first caught national attention when his former biology teacher launched a GoFundMe for him. WASHINGTON -- Georgetown University has awarded a full-ride to a gay teen who was kicked out of his parents’ house due to his sexuality. “Earlier this year (after a year of attempted conversion therapy), Seth’s parents gave him an ultimatum. He would either continue to attend the church that outwardly attacked him and his sexual orientation or he would need to leave home. For his own well-being and safety, Seth chose the later [sic],” teacher Jane Martin wrote. Owen, who graduated high school valedictorian, had been admitted to the prestigious Georgetown University. Despite the lack of financial support from his parents, Owen learned he would still owe the school $20,000 for his first year. For most students without full financial aid, this means taking out private loans. But, for Owen, he would have needed his parents to act as necessary guarantors. And with that, it looked like Owen’s dreams of attending the university were over. That’s when Martin stepped in, asking for the $20,000 to help put Owen through his first year. “It’s Pride Month and rainbows abound around the world. Help me bring a rainbow in the midst of Seth’s storm,” she wrote. Within 1 month, over 2,000 people raised more than $133,600 for Owen to go to school as over a thousand people shared the page. “My dreams have come true because of you all,” Owen wrote on the page after learning the goal had been put. But, on Friday, Owen found out he wouldn’t need that money for school after all. Owen wrote that the Office of Student Financial Services had been actively working with him as the campaign went on. “Due to their efforts and attention, they were able to adjust my aid package even further, my expected contribution is now $0. With these new adjustments, I will be able to attend Georgetown University this fall,” he wrote. Owen will be going to school at Georgetown in a few weeks where he says he has an interest in foreign service. He will also attend as part of a scholarship program that provides networking and mentoring opportunities. As for all the money Martin helped raise, Owen says he hopes to work alongside Georgetown University to create a scholarship fund for LGBTQ+ students in similar situations he was in. “Again, a simple ‘Thank You' seems to be not enough for all of the support I’ve received from so many. I will be seeking to pass on the kindness and generosity that I have been shown,” Owen wrote.